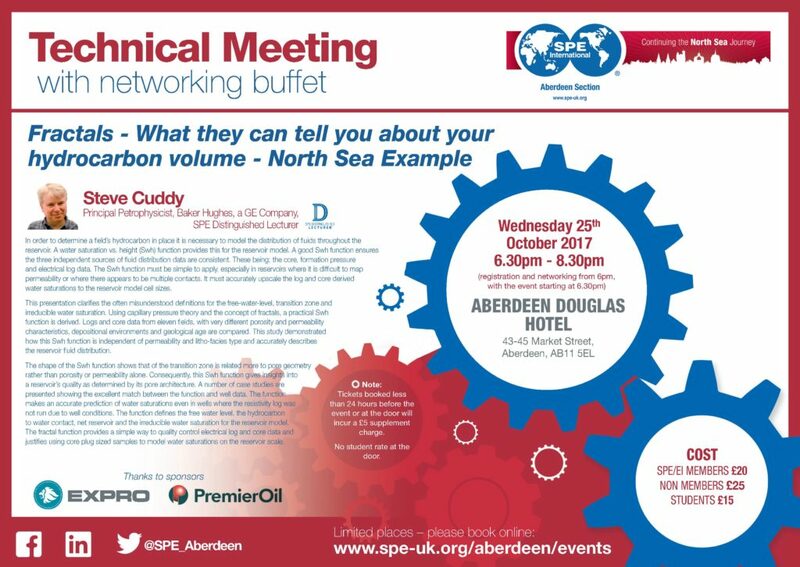 Fractals – What they can tell you about your hydrocarbon volume North Sea Example – SPE Distinguished Lecturer Dr Steve Cuddy of Baker Hughes, a GE Company. 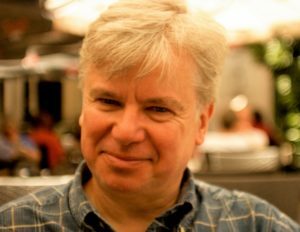 Steve Cuddy is an Honorary Research Fellow at Aberdeen University where he holds a doctorate in petrophysics. He also holds BSc (Hons.) in physics and a BSc in astrophysics and philosophy. He is currently a Principal Petrophysicist with Baker Hughes, a GE company, and has 40 years industry experience in formation evaluation and reservoir description. He has authored several SPE and SPWLA papers and carried out more than 200 reservoir studies. In order to determine a fields hydrocarbon in place it is necessary to model the distribution of fluids throughout the reservoir. A water saturation vs. height (Swh) function provides this for the reservoir model. A good Swh function ensures the three independent sources of fluid distribution data are consistent. These being; the core, formation pressure and electrical log data. The Swh function must be simple to apply, especially in reservoirs where it is difficult to map permeability or where there appears to be multiple contacts. It must accurately upscale the log and core derived water saturations to the reservoir model cell sizes. This presentation clarifies the often misunderstood definitions for the free-water-level, transition zone and irreducible water saturation. Using capillary pressure theory and the concept of fractals, a practical Swh function is derived. Logs and core data from eleven fields, with very different porosity and permeability characteristics, depositional environments and geological age are compared. This study demonstrated how this Swh function is independent of permeability and litho-facies type and accurately describes the reservoir fluid distribution. The shape of the Swh function shows that of the transition zone is related more to pore geometry rather than porosity or permeability alone. Consequently, this Swh function gives insights into a reservoirs quality as determined by its pore architecture. A number of case studies are presented showing the excellent match between the function and well data. The function makes an accurate prediction of water saturations even in wells where the resistivity log was not run due to well conditions. The function defines the free water level, the hydrocarbon to water contact, net reservoir and the irreducible water saturation for the reservoir model. The fractal function provides a simple way to quality control electrical log and core data and justifies using core plug sized samples to model water saturations on the reservoir scale.